Alice in Wonderland Party ideas from mylar balloon toadstool decorations to edible teacups made from ice cream cones and cookies, make up a huge list of some of our favourite Un-Birthday, Mad Hatter’s Tea Party, Alice in Wonderland inspo for your next trip down the rabbit hole for a perfectly whimsical and completely mad birthday party! Stack paper tea cups, play a round of flamingo croquet, decorate your own hats, play dress ups, go on a treasure hunt for keys, or pop on the movie – we’ve rounded up a few of our fave party ideas for your Alice in Wonderland do! These fun DIY Paper Tea Cups from Red Ted Art are more than just a great decorative idea for your Alice in Wonderland Party. Hold a Mad Hatter’s Tea Party tea cup race and have the kids race egg and spoon style balancing a tower of tea cups. This is kind of the perfect party game for an Alice In Wonderland Mad Hatter’s Tea Party! There are a few different ideas for all different budgets, with the added plus that Alice in Wonderland DIY Flamingo Croquet will act as decorations too! Like pin the tail on the donkey, blindfold the kids and get them to pin the grin on the Cheshire Cat. Plastic hats from your local $2 shop, glue sticks, and foam shapes make for a great party activity for all ages! Collect and hide keys in the yard, and let the kids find them – a simple and fun activity for your little guests! A Mad Hatters Tea Party or the perfect UnBirthday isn’t complete without mad hats! Set up a haberdashery and let the kids go crazy dressing up for afternoon tea! This DIY might take a little trip to Bunnings, but you could also use thick foam core from your art shop if you’re not handy with plywood and tools. Get the kids to toss soft toys or bean bags made with rice in old socks for a fun afternoon activity. What’s a Mad Hatters Tea Party without a cup of tea?? Visit the Salvos or Vinnies and buy up white tea cups and saucers (you should be able to get them for less than $2 a piece) and use glitter, glue, and paint markers so the kids can create their own tea cups. Fill them with sweets before they leave for the day as a fun party favour! Capture the moment with fun cut out props or these great standing cardboard cutouts. For older kids use Polaroid cameras (or similar) and watch the joy as their fun snaps materialise before their eyes! Lawn games and a garden party go hand in hand, and giant chess is perfect for an Alice in Wonderland party! This giant chess set was created from corrugated cardboard using an industrial laser cutter – not something we’ve all got sitting in the garage. A pencil and a craft knife will take a little longer, but have the same effect and bring hours of fun to your Mad Hatter’s Tea Party! DIY Toadstools will turn your backyard into a magical woodland whether they’re decorative, or actually for seating! We can think of so many fun uses for these DIY Paper Tea Cups! Perfect for a Mad Hatter’s Tea Party or anything Alice in Wonderland. Place them on tables, string them from the ceiling, and fill them with lollies for a candy buffet or sweet table, or tie a name tag to the handle and give them as party favours. We completely love the DIY Tea Cup Cupcake wrappers too! It’s the kind of detail that sprinkles your party with a little extra special magic! Use adhesive googley eyes from your local art or craft shop and add them to the plants in your garden, or use hot glue to attach them to silk flowers for fun table centrepieces like these ones from. If you’re able to plan ahead, keep your eye out on council clean up night for old chairs, visit your local Salvos or Vinnies, or have a look in the back shed. Grab out some spray paint or recover the chairs in your chosen colour palette. We love this look in pastels or brights! String lanterns above the table and get ready for tea! If you’re handy with a sewing machine, turn your chairs into playing card soldiers! Recycle old palettes into signage for your tea party like this one from Lux Events and Design. You could also use brightly coloured cardboard and paint to create completely confusing signage for a perfect decoration! We love this DIY! We love cake stands, so it’s only natural. This DIY shows you how to create whimsical and bright cake high tea cake stands from plates and candle sticks – perfect for your Mad Hatter’s Tea Party! This incredible DIY was created by someone who was inspired by the most recent Alice in Wonderland Movie and Johnny Depp’s hat. Decorate for a table centrepiece or wear it yourself, no matter how you use it, this is a super fun DIY addition to any Mad Hatter’s Tea Party! Use large heart, club, diamond and spade cookie cutters to cut your sandwiches, a fun and affordable way to carry your theme through the party! We love the mini burgers with playing card suit toothpicks too. Anything heart shaped is easy to fit into an Alice in Wonderland themed party, don’t forget the savoury! These “Queen of Tomato Tarts” are completely gorgeous. Of all the Alice in Wonderland sweet tea party snacks we found on our hunt for party ideas our favourite is the Cheshire Cat Tails! They’re bananas dipped in purple candy melts with stripes of pink candy melts and so creative! The marshmallow and apple edible toadstools are great for woodlands parties too! Oppulence and fun is the order of the day for any Alice in Wonderland Mad Hatter’s Tea Party, but you don’t need to spend a fortune to achieve that! Upcycled teapots sprayed with gold paint make the perfect vessel for fresh flowers, mismatched china, and piles of sweet treats are a beautiful way to carry your theme through the whole party. Add lots of layers and different heights (see our link for the DIY cake stands if you don’t have high tea stands) using high tea stands and lovely old books. This Party Pieces by Perry Alice in Wonderland Party, featured on Catch My Party is filled with incredible ideas that you can DIY at home. Visiting your local Salvos and Vinnies and collect mismatched plates, tea cups, saucers and platters is a cost effective way to create a whimsical and vintage Alice in Wonderland Mad Hatter’s Tea Party. If you can plan ahead, pop in once a week for a couple of weeks – you’ll be surprised what you can find! We love the massive paper flowers that create a beautiful backdrop to the party, and (like the Country Living party below) we adore the teapots filled with flowers! Stacks of meringues and piles of marshmallows make for a feast fit for the Queen of Hearts! This Country Living feature was a post filled with beautiful ideas for a Valentines Day brunch. We love the playing cards strung up as bunting, and tea pots and tea cups filled with flowers. Personalise packs of cards in tins with illustrations from Alice in Wonderland for the perfect gift for guests! Our favourite detail though, is the chocolate sponge cakes cut with spade and club cookie cutters – such an easy way to continue the theme through your whole party! Sweet Scarlet Designs created this incredibly fun, bright and mad tea party. We can’t get enough, and even better you can download and use all the printables yourself! From Kiss With Style this party is gorgeous! Edible teacups and toadstool meringue pops are so fun for this theme (see more below), but what we’re loving most is the cake. Whether you’re an expert cake decorator or just getting started, this is an easy way to create a sweet centrepiece for your table. 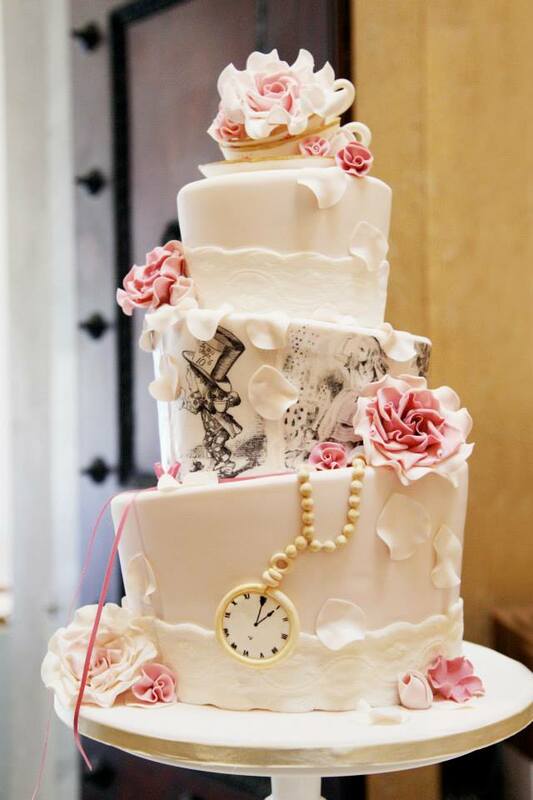 Cover your cake in frilled layers of fondant and sit a teapot or cup and saucer on top, no modelling required! This completely refined and chic 60th birthday party from The Style Co is proof that Alice in Wonderland parties are for everyone! We love the behind the scenes shot of the team painting the roses red – such a creative and whimsical touch, and the menus, but makes sure you head over to take a look at all the details in this epic soiree! Send guests home with inexpensive and thoughtful themed gifts to remember the party by like the DIY Tea Bags from Celebrations At Home filled with home made cookies. Fill small jars with sweets to match your colour scheme and tie with eat me tags like these ones found on Etsy. Crack out the sewing machine and create hand made costumes with the patterns we’ve found. Or if you’re better with a hot glue gun, sacrifice some packs of playing cards for these crafty ideas to Alice In Wonderland (we’ve made it a verb) some items already in the closet! Playing cards seem to be the order of the day for Alice In Wonderland themed party invitations, and why not! These two are super cute examples of fun and creative playing card invites! These beautifully styled photos from Kim Morphew for Sainsbury’s Magazine look soooo delicious! You’ll find the recipes here. This list could have been thirty times it’s size, so here are just a few of our favourite cookies, cake pops, cupcakes, edible tea cups, ideas for edible toadstools, cakes and more! Download your free Flamingo Party Printables, just click one of the images below!